I’ll own to being lazy. It’s mostly on account of my curmudgeonly front yard. I say “English cottage garden” and it snarls back with sieve-like feet upon feet of inert yellow sand. (Thank you, Lake Iroquois.) I think “peonies” – it hands me a thirsty webwork of impenetrable Norway maple roots. And shade. Lots of shade. So anything that stands up to such curmugeonliness gets cheers from me. 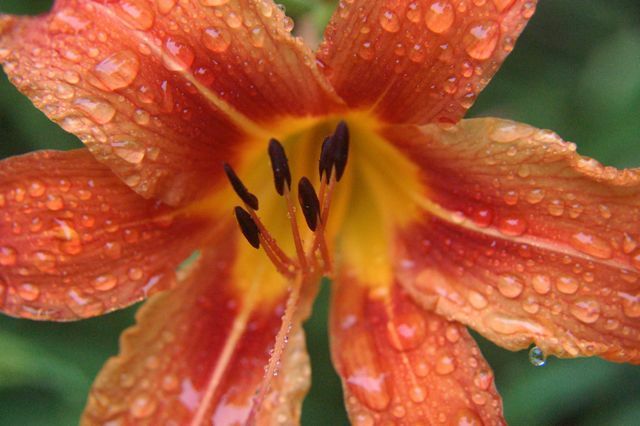 Which brings me to today’s Pollyanna, the plain old orange daylily, tiger daylily or ditch lily, Hemerocallis fulva. It runs through my garden with a happy tra la la la la. And when I say runs, I mean scampers, sprints, lopes, tears, gallops and bounds. To keep it in check, I am constantly yanking up shoots and roots. When it blooms, all is forgiven. But it’s over so quickly. Recently, from the always (and all ways) entertaining Paghat’s Garden, I was awakened to the fact that many of the daylily parts I’ve been tossing on the compost heap are edible. Those young shoots and roots and both the flower buds and spent blooms all have food value. A little more research found this article on how to eat daylilies on Honest Food. Hmmm, something to chew on. But, really, the tawny daylily is a poor cousin to the many, many, many variations that busy hybridizers have been creating. These days, it’s not the vigor of the roots that counts, it’s the vigor of the flowering scapes – with their mind-boggling numbers of buds. Think about it: a scape bred to produce 31 buds would mean nearly a whole month of bloom – not just the week or so my tawnies give me. If I weren’t so lazy, I’d be digging up all the tawnies right now (well, right after they finish blooming) and replacing them with something better, sturdier, bloomier and quite possibly fragrant. Of course, I’d have be sure no roots had escaped my spade before planting anything new. Sigh. To prove I’m not a totally monogamous daylily lover, here’s a rare bloom of H. ‘Gentle Shepherd’. The Ontario Daylily Society has a whole page of Canadian hybridizers and growers to choose from. I just expended a lot of drool browsing through a couple of Southern Ontario sites, The Potting Shed near Dunnville and We’re In the Hayfield Now east of Bowmanville. 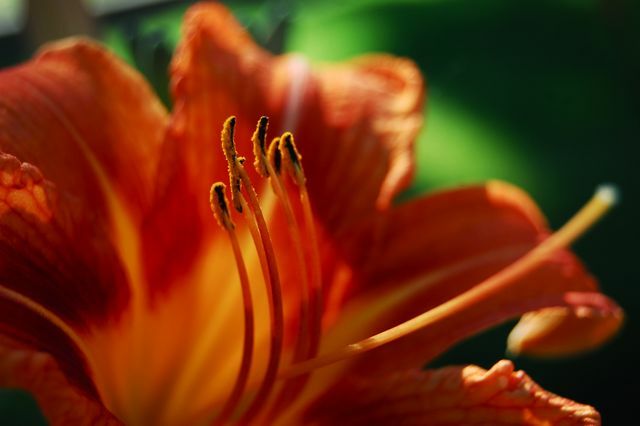 It’s the right time of year to see daylilies in bloom, to meet the ones you love face to face. [Note: written in 2009; check for current info.] The Potting Shed is open for viewing daily, 9 to 5, from May to the end of September. We’re In the Hayfield Now has a special open garden at the end of this month, July 24, 25 and 26 from 10am to 4pm. Wish I could be there. Meanwhile, I’ll resort to lazy-faire and, like Scarlett O’Hara, I’ll think about that tomorrow. How do the more rarified daylilies do in the battle against the Norway maple? I read somewhere the daylilies hate root competition, but if they make it in your yard, they'll make it anywhere! The more rareified daylilies aren't too happy in my Norway Mapled garden. It's not only the roots, but the shade that makes them sulky. I have a clump of Gentle Shepherd daylilies in my shady "Hell strip" and I think in 5 years I have had one or two blooms. I'm digging them up this year and moving them to the country. On the other hand, in a sunnier spot – my rockery I have a clump of deep velvety-red daylilies – a real stunner and I wish I remembered the name of it – that does a pretty good job of blooming every July. I had a bed out of town, where I did successfully manage to get rid of some tawny lilies, by weeding them out bit by bit. It took a couple of years, but I got them out. It will be harder for you, Helen, as you have hybridized lilies in the same bed: harder to tell which is which. Also love Paghat's Garden, by the way. Nice to see you mention it. Hi Helen, this is a quandry, but when something does so well it is hard to dig it out and replace with something that might struggle. That said, there are so many good, make that great cultivars out there that you might enjoy it would be worth the effort to eradicate the wild one. Or not, but plant a nice group of named varieties elsewhere and maybe add some over the years to the front? You're right, daylilies don't like root competition because they're so rooty themselves. The tawny daylilies for me make lots of leaves and fewer flowers than they would in a sunny, root-free location. That said, in those places they actually compete with themselves, and can require division. I exaggerate somewhat for effect. There are a few other varieties in the front garden. I have one called 'Damask Silk' for example that does bloom. However, the plain old fulvas are far greater explorers, boldly going where no daylily has gone before. Remember that the off-set of 'Gentle Shepherd' doesn't really go gangbusters for me in the back garden. It might just be a more reluctant bloomer. Very pretty when it does, though. I'm not really sure why so many people have a hate on for Stella. It isn't her fault that people abuse her. It's like dog breeds that are reviled, when the fault really lies with the owners. You just go ahead and enjoy those cheerful Stellas — I'm sure you treat them well. I have three words for you: sandy, dry, shade. A week or so of bloom is a blessing, I'll tell ya. I'm going to be investigating daylilies that stand up to tough treatment and will report back for the benefit of the equally dry shade challenged. Cheers, everyone, and thanks for your comments. 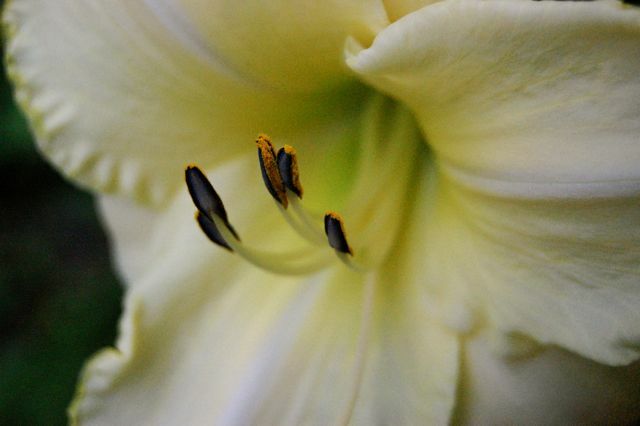 I think one of the difference between the newer daylilies and the old species is that the the newer ones tend to form more circular clumps that stay that way, (eventually growing outward from there, but remaining in a more orderly circular form). The older ones, however, have a more rangy habit of spreading every which way, and colonize a large area more quickly. That's what I've noticed in my garden anyway. What’s growing in May & June: Alliums!